The Lake Room (a standard room)- The sunniest room with a south-facing view of the lake, Yule Falls and the avalanche chutes of Whitehouse Mountain and Raspberry Ridge. Westward views of Chair Mountain and the Raggeds. Great light from sunrise till sunset. Direct access to the balcony reading nook looking down into the great room. Queen-size bed or 2-single beds by request and private bath. Top floor. 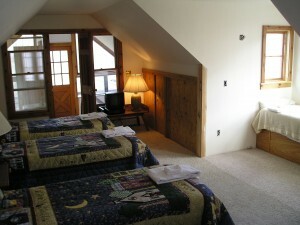 Elk Mountain Room (a standard room)- Great afternoon and evening sun with the best views of the winter elk herd. North views of Gallo Hill Cliffs and Elk Mountain. West view of Chair Mountain and the Raggeds. Direct access to the balcony reading nook looking down into the great room. Queen-size bed or 2 single beds by request. Private Bath, Top floor. Gallo Hill Room (a standard room)- Great afternoon sun and evening sunsets. North views of Chair Mountain and the Raggeds. Closest to the great room and the kitchen for easy late night raids on the fridge and snack area. 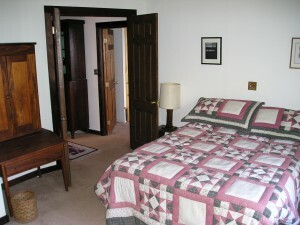 Queen size bed or 2-single beds by request and larger private bath. On the second floor. The Walnut Room (a mini-suite)- Sunny with all south facing windows. Furnished with pre-civil war walnut primitives and king-size bed. A private exit to the main deck makes it popular with star gazers. Larger private bath with a private Jacuzzi tub and opposing shower heads with duel controls: A favorite for couples. Ante-room has direct access to the meeting room making it popular with group leaders. Queen-size bed or 2 single beds by request. On the first floor. The Chalet Apartment– A private apartment in the adjacent studio building with a kitchen on the ground floor and spiral stair leading to the 12×24 bedroom/sitting room. Private balconies on both ends and a bath with antique pedestal sink and claw foot tub from which the bather has an exceptional view of the lake and Sheep and Whitehouse Mountains. Popular with couples or friends who want to share a bigger space. 2-Queen size beds or 4 single beds by request. The Captain’s Room– A cozy little first floor room off of the meeting room with nice morning light. 2 twins in bunk bed configuration. Toilet and shower apart down the hallway (robes furnished). Perfect for spare friends or kids of a couple in the Walnut Room or for the youth-hostel-friendly who merely need a comfortable bed and full use of the rest of the retreat. 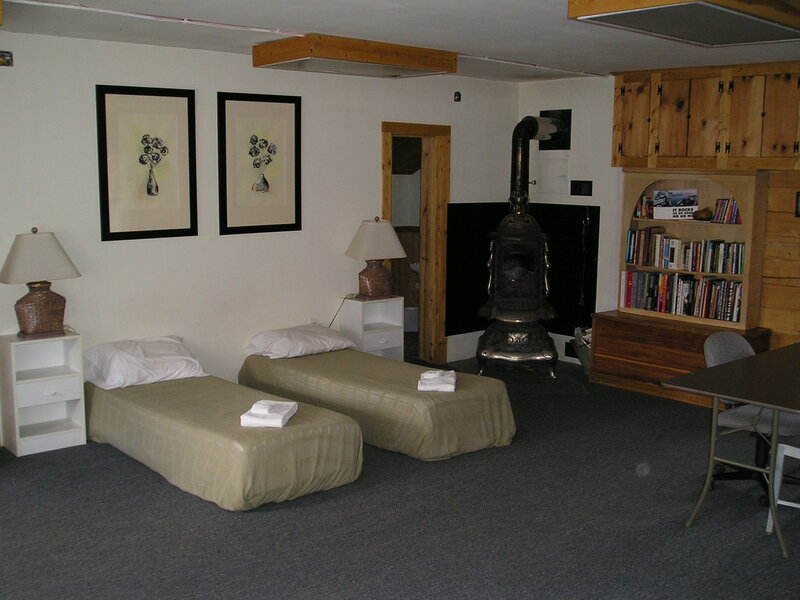 The Dormitory: Has several bunks and 2-bathrooms and ornate working pot belly wood stove apart from the main lodge. Ask for a bed chart to determine maximum double-room and dorm occupancy appropriate for your group. 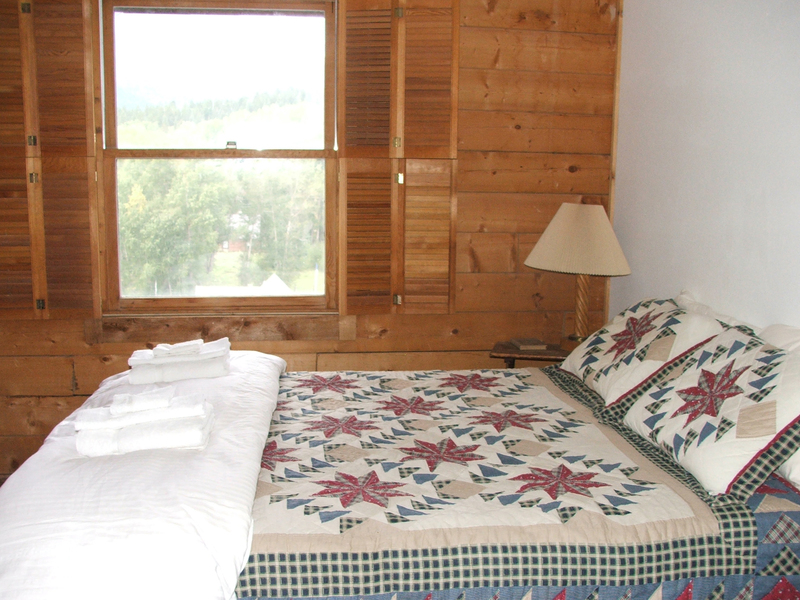 Additional Accommodations: For groups larger than 24 which our six private guestrooms (double occupancy) and dorm bunks can accommodate, we can arrange (with advance notice) additional accommodations at the rustic lodge next door. For the more adventurous or budget minded there are a few tent sites on the grounds of the retreat and we can provide information on public campgrounds and additional guest rooms in the area for people attending an event or retreat. All guest rooms are furnished with quality, fresh bed and bath linens and soap for your arrival. Bring your own favorite toiletries. 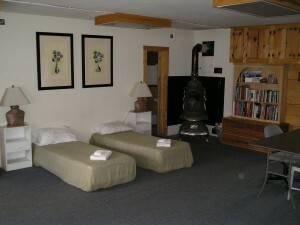 Linen service is available for stays longer than three nights or if needed.